Tonight marks the start of Yom HaZikaron (Israeli Memorial Day). It is designated to be the day preceding Yom HaAtzmaut (Israeli Independence Day) as a commemoration of those who lost their lives in the struggle that led to the establishment of the State of Israel and for all military personnel who have been killed while on active duty in Israel’s armed forces. Just like on Yom HaShoah, an air raid siren plays twice in Israel during Yom HaZikaron. During the sirens’ soundings, the entire country comes to a complete stop in honour of the fallen. The first siren marks the beginning of Israel’s Memorial Day, and the second is sounded immediately prior to the public recitation of prayers in military cemeteries. A total of 23,544 soldiers of the Israel Defense Forces have fallen defending the country. Over the past year, a further 97 have joined the fallen ranks. There are currently 9,157 bereaved parents in Israel, 4,881 widows from the army and security forces, 1,843 orphans under the age of 30 and thousands of bereaved siblings and older orphans. Yom HaZikaron is also a time to remember those who have died in terror attacks. According to National Insurance Institute data, since the day of the declaration of the state on May 4, 1948, 3,117 civilians have been killed in acts of terrorism. That figure includes 122 foreign nationals killed in terrorist attacks in Israel and 100 Israelis killed in terrorist attacks abroad. The end of Yom HaZikaron also marks the beginning of Yom HaAtzmaut. This is intended to remind people of the sacrifice soldiers and their families and friends have paid for Israel’s independence and security. This transition shows the importance of this day among Israelis, most of whom have served in the armed forces or have a connection with people who were killed during military service and is a reminder that independence came at a price. 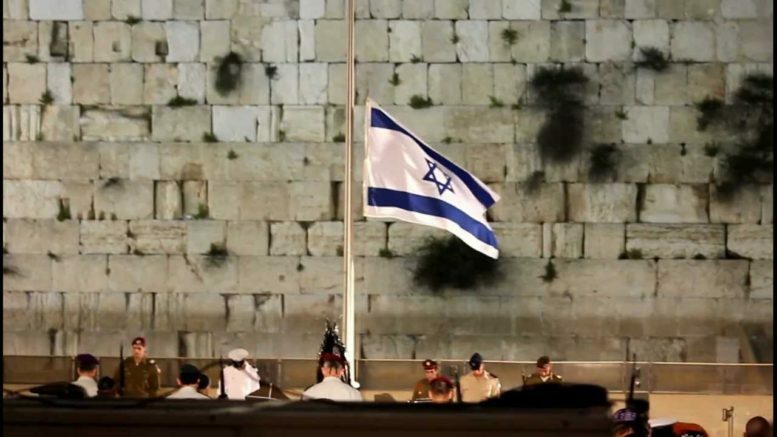 The official “switch” from Yom Hazikaron to Yom Ha’atzmaut takes place a few minutes after sundown, with a ceremony at Jerusalem’s Mount Herzl military cemetery in which the national flag is raised from half staff to the top of the pole. The establishment of the State of Israel was on the 5th of Iyar, 5708, (May 14th, 1948 in the Gregorian calendar), and marked the restoration of Jewish independence, lost two thousand years earlier. Other than the official ceremonies, Israelis celebrate Yom Ha’atzmaut in a variety of ways. In the cities, the nighttime festivities may be found on the main streets. Crowds will gather to watch public shows offered for free by the municipalities and the government. Many spend the night dancing Israeli folk dances or singing Israeli songs. Yom Ha’atzmaut is concluded with the ceremony of granting the “Israel Prize”, recognizing individual Israelis for their unique contribution to the country’s culture, science, arts, and the humanities. Shalom.Kiwi honours those who have fallen to create and protect Israel over the years and celebrates at the restoration of the Jewish homeland and all those Israelis who contribute to the country and the world.